I am not entirely sure why more people don’t pickle blueberries… or really any sort of berry. Pickled blueberries, currants, huckleberries, saskatoons and the like are an almost perfect accompaniment to meats, poultry and fish. 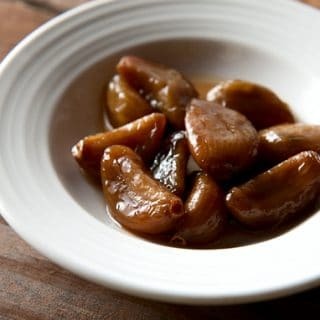 Sweeten the pickling liquid a bit more than in this recipe, and you have a fantastic thing to drizzle over ice cream and other desserts. And the leftover pickling liquid? An amazing base for a homemade soda — just mix the sweet blueberry vinegar with seltzer and ice. Making pickled blueberries cannot be easier. Put blueberries, currants, huckleberries, etc. in a clean jar, pour over boiling vinegar mixed with a little sugar and salt, and you’re done. I did this with a stash of tiny Sierra Nevada blueberries I picked at 7000 feet. A year later, they were perfectly fine in my fridge. 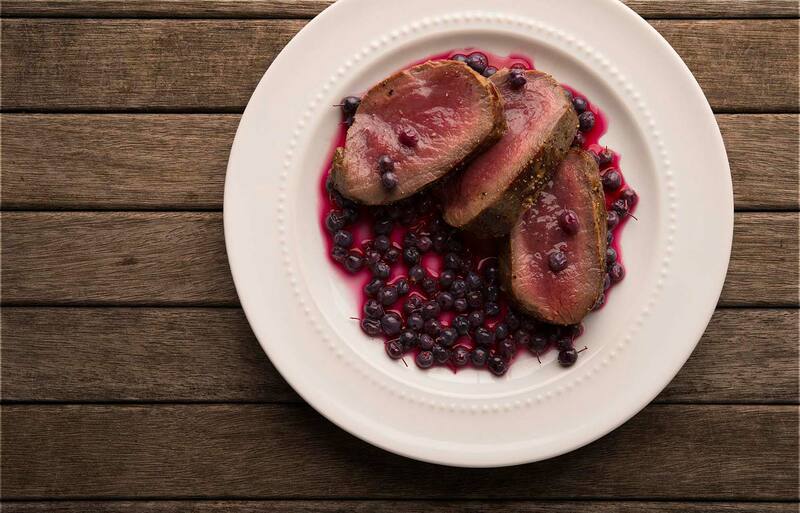 I want to taste pure blueberry with this recipe, so I don’t add other flavors. If you want to experiment, you can add things like herb sprigs (rosemary is a good one), or spices such as cinnamon, allspice, clove or star anise. And if you are looking for a dessert pickle, double the amount of sugar you boil in the vinegar. 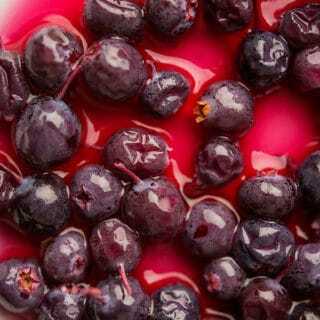 This is a simple recipe for pickled blueberries I use as a condiment with meats like venison, duck, goose or dove. It would be equally good alongside lamb, pork or turkey. If you want pickled blueberries to go along with sweet things, add more sugar. Consider this a master recipe you can play with. 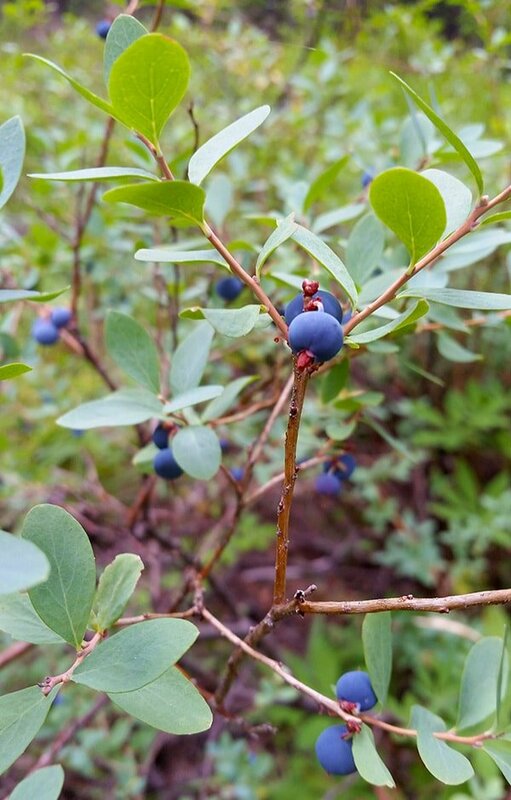 Pick over the blueberries for any mushy or unripe berries; discard those. Pour the nice ones into a pint jar. I like wide-mouth jars. Boil together the salt, sugar and vinegar. Pour over the blueberries, leaving about 1/4 to 1/2 inch headspace in the jar. Wipe the jar rim and put on the lid. Kept this way, the blueberries will last a year or more in the fridge. If you want to keep your pickled blueberries on the shelf, make sure you use a new lid, and water-bath can your jar for 10 minutes. Obviously if you want to do this, you should triple or quadruple the recipe to make it worth your while. NOTE: You can add a sprig of rosemary, a broken cinnamon stick, a star anise pod, a couple cloves, a few allspice berries, maybe a sliced onion or a few pieces of fresh ginger. You can find all sorts of recipes for pickled and preserved foods right here on Hunter Angler Gardener Cook! Sarah: It’d be OK, but they are awfully seedy. Great recipe! I have served it with pork, halibut, chicken, just to name a few. Added in some sliced red onions on occasion, which has also been a hit.